GENDER: It’s official, Little Bro has a name: Beau Hudson. I couldn’t be more excited to begin referring to him by name. WEIGHT GAIN: 17 pounds as of 26 weeks. Wowza, that was quite a jump in one month, though I knew it was coming because my belly has really grown over the past two weeks. Just look at how it looks above vs. week 24. And in case you’re wondering just how much bigger my belly is this pregnancy, see pics of me at 25 weeks with JM. MATERNITY CLOTHES: With the rapid growth of my bump the past two weeks, maternity clothes have become necessary staples. The thought actually crossed my mind that my maternity clothes may not fit throughout my entire pregnancy this time if the bump continues on this growth path. But don’t let all this talk of growth fool you about my self confidence; I recently ordered this maternity bikini that was delivered this week. I feel confident in it now, we’ll see how I feel in another month when I vacation in Hilton Head. But hey, at least no one will know me there! 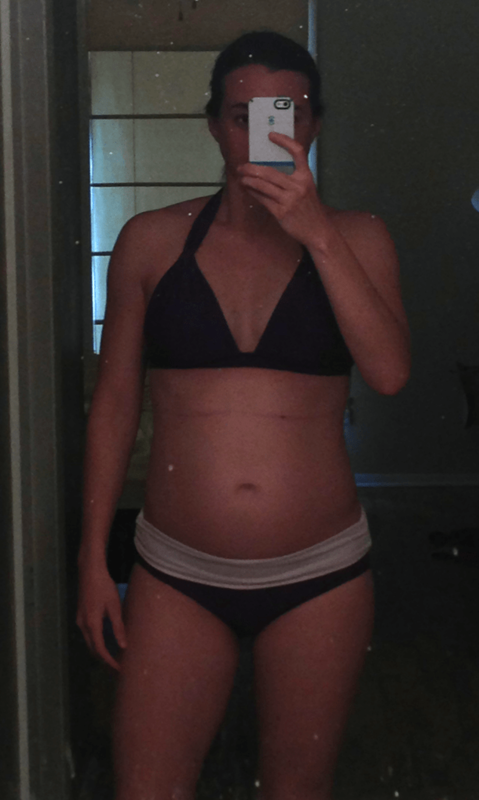 And since I neglected to do a 25 week bump update and picture last week, here I am last week in all my bare-belly glory. My mother will cringe when she sees this, but hey, I’m 31 years old, Mom. Oh, and that crease you see across the top of my stomach, when I’m not pregnant it would be much lower to account for rolls when I’ve been sitting. But when you’re pregnant, it just moves up higher on your stomach to account for a growing uterus. SYMPTOMS: Besides the weird nausea, I’ve also been feeling what I’ve self diagnosed (with the help of Baby Center) as Braxton Hicks. I never felt these with JM, because, as I’ve said a thousand times, his was the easiest pregnancy ever. But with Beau, I started feeling this crazy tightening a week or so ago. Tight as in “don’t touch my belly because it might just pop.” There is no associated pain, just tightness, so that’s good. And it’s not constant, thankfully. So for now I’m assuming they are Braxton Hicks, which everyone else seems to have already experienced. WORKOUTS: Besides the 2.5 hours of bike riding and 1.5-hour rope and zip line course James and I conquered in Callaway Gardens on Saturday, workouts have once again taken a back seat. I managed to make it to the gym Monday afternoon, and that’s when the nausea really started hitting me and I had to quit the WOD two rounds into Helen. I’m heading up to the gym this afternoon because James has been hanging out with JM all day. And as always, I have great plans for WODs on Fridays and Saturdays, though half the time those fall through despite my best intentions. Despite my lack of true CrossFit WODs, rest assured that I am rarely sitting on my laurels. When I’m not at the gym in the afternoons, JM and I are typically galavanting around at a park (last week I burnt the back of my thighs going down a big kids slide clutching JM–because he just loves slides so much) or making a trek to the grocery store where I attempt to carry him plus several bags of groceries up the stairs at once. And once I get him dinner, bath time, book time and into bed by 7:30 p.m., I dive straight into picking up our ransacked house and making dinner. Typically I sit down for about an hour each night, starting at 8:30 p.m. So I definitely stay active.